I just love this quilt. It looks so awesome! Our bed is so comfortable. 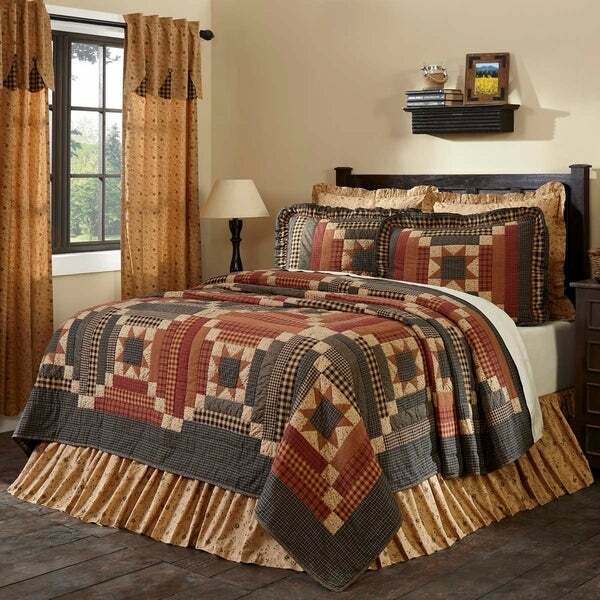 The Cobblestone Luxury King Quilt features 8 point stars set in tan Irish chains of ditsy floral prints. Stout courthouse step blocks of country black and burgundy balance dainty floral patterns to create a look with wide appeal. courthouse step blocks are arranged to create lines of black and burgundy. Hand quilted, 100% cotton, reverses to black and tan check found on front. This quilt is as pictured. I purchased the oversized king, and it is truly oversized. I am very pleased with the quality of this quilt. I was hoping that there were some blues in this quilt, but there is not. I would say it’s made up of 3 colors, black, barn red, and a golden tan. I love this quilt. The colors just as I hoped with more of a red barn type color that with the natural/beige and blue is everything I hoped for. The flowers that is on the natural color makes the quilt look so dainty. I couldn't wait to put on my bed. Perfect fit with the edging on it, which I didn't know it had , very nice surprise. The quilt is well made. Actually much thicker than anticipated. Probably good for all most of the year. Although I haven't washed yet I am hoping it won't disappoint. Yes I would recommend. Great quilt. I am so happy with this VHC quilt. Beautiful, subdued colors. A bit dark, probably owing to so much black in the prints, but I like the richness it lends to the room. Well made product. A faint odor that smells a little like incense. Not surprising, as the quilt is made in India. Beautiful Quilt & excellent quality. Beautiful quilt, very well made, love the colors. The pictures just don’t do it justice. Will be adding more pillows to the bed. Quilt cover arrived earlier than expected, which was a nice surprise. Excellent quality, heavy-weight, very well made. Got precisely what I was looking for. Matched the shams perfectly. Very pleased with my purchase. Very happy with the Maisie quilt. Love the color combination. It looks beautiful on my bed. Perfect size and colors are very rich. Love the whole look. Just love how my bedroom looks now. I received my quilt today and I am so very pleased! It is just beautiful! Beautiful! Beautifully mad and very cozy. Beautiful quilt! The picture does not do it justice. Very nice quality and not too heavy. "Are there any blues in this quilt, or are all of the darker patches black? " The colors are Natural, Country Black, and Burgundy. "How does this quilt do in the wash (per the instructions)?" 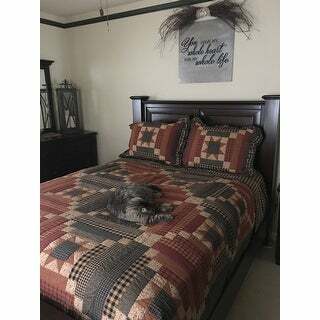 "Where can I get the throw and the pillow cases that match this Maisie Quilt? Thank you"